As I mentioned last night I have two batches of minis I've been working on the last few days. First, the last of the minis from John's Warhammer Underworlds: Shadspire core box - the Khorne Bloodbounds (which I may have previously referred to as "BloodHounds"...?). Normally I'm not keen on painting the edges of bases black, but it seemed like the right thing to do here... I'm not sure why...? The inquisitor is a miniature I've had for about 25 years. I'm not sure I ever completely finished painting him...? A few years back I stripped all the original paint off of him and rebased and primed him and now, finally, got around to repainting. The others are more recent minis I've acquired over the last few years and finished up in hopes of making use of them in the Rogue Trader campaign I'm planning to run. 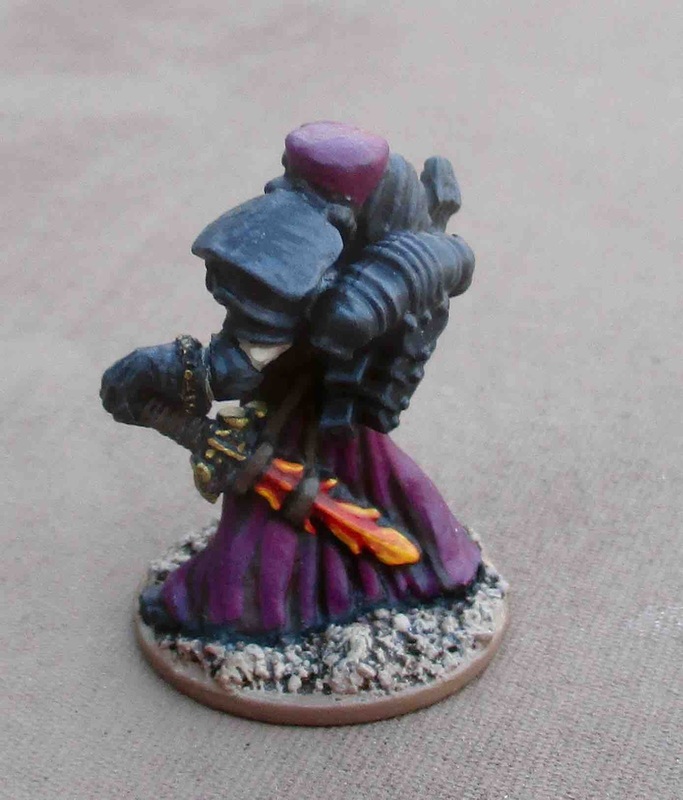 I really like the Ministorium preacher figure - he has lots of stuff strapped to his back pack and looks like a regular adventurer that's ready for anything. I tried taking a few individual pics, but the lighting was crap and most didn't turn out. That typing servitor looks waaaaaay too healthy... I should have made his skin paler... I may go back and change that. Nifty models and brilliant brushwork, Tim! I cannot seem to be able to read the scroll work, though. That preacher figure is the one I modded for use in my Witch Hunter Mordheim band. Your right about his backload of goodies! Exellent work as always Tim! Did you carve off the Lasgun then? Replaced the chainsword with something a little less... chain-y? Oh, and the grenades... seems you would have had to do quite a bit of converting! 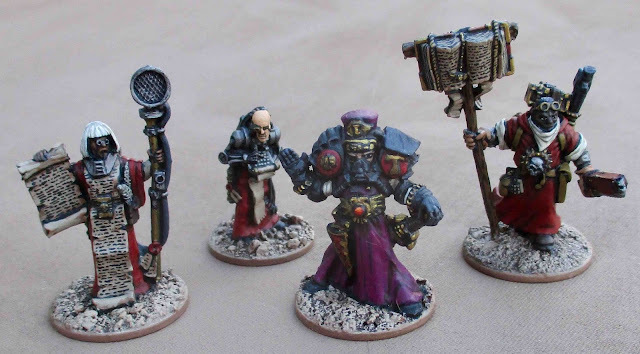 Nice blood bond, I really like the inquisition figures, it's the most appealing part of the 40K universe and these are excellent!